Yard long beans when combined with chana dal makes an excellent combination for rice as well as roti.Beans,dal and garlic chilli powder adds a unique taste to the curry which is very well balanced in flavor. Wash and wipe the yard long beans and chop them into 1/2 inch pieces. To make Garlic Chilli powder grind red chillies along with grated dry coconut and salt to a coarse powder.Add garlic cloves to it at the end and grind again. Heat oil in a deep bottomed tawa and crackle mustard seeds. Add crushed garlic,curry leaves and fry for a minute.Add finely chopped onions and fry until they are translucent. Add the chopped beans and fry for 2-3 mins.Cover it with a deep bottom plate and fill it with water and let the beans cook on steam for 12-15 mins until the beans are tender. Add chana dal to it and fry for 4-5 mins. Add the ground spice powder to it and mix and let it cook for a couple of minutes. Remove it from fire and serve hot. Serve it hot with hot rice and fryums/papad or serve it with roti. 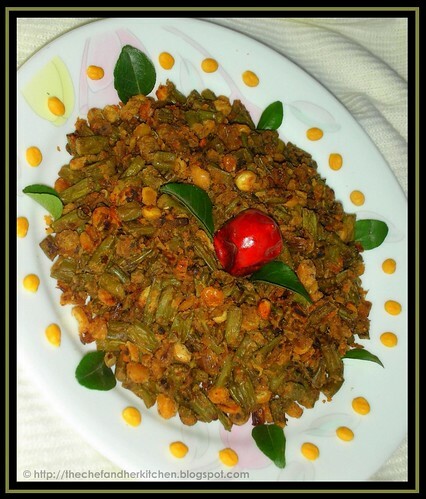 You can use cluster beans/gawarphali/goru chikkudu instead of yard long beans in this recipe and follow the same procedure.Just that you need to parboil o pressure cook cluster beans before proceding to make the curry instead of steam cooking it. This is going to participate in MLLA-18 hosted by Srivalli of Cooking 4 all seasons event started by Susan of The Well-Seasoned Cook. Hi Prathy, am I the first one here? It's been quite sometime I got hold of these beans..lucky u. I always like the combo with chana dal, even cabbage tastes so good with it. Will make ur version when I get them next..
Hey do drop by whenever u get time dear. 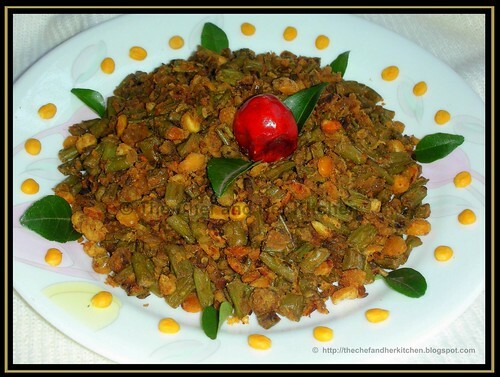 Delicious and prefect side dish for rasam rice..feel like having rite now.. Very nice presentation. I think this goes well with rice. i love the combo..looks really yummy and perfect with rice..
Usually if we combine channa dhal is watery our curry!This one sounds good! What a nice click !! Wow looks so delicious, perfect sidedish with anything. Nice one. Sounds like a great combo!! Lovely click! Btw, I tried your "Snake-gourd kura" last week.. It was simply fabulous and DH n me relished it till the last bit! Will post it soon n link it back to ya! Usually I sprinkle water to cook the beans.. You have an interesting idea to cook the bean with a deep bottom plate filled with water! never heard of it.. I'm sure this will reduce the sogginess of the beans.. Will try it next time for sure! Beans looks delicious and spicy! excellent presentation and nice click too.adding channa dal will surely give a creamy texture. Lovely stir fry..thanks for sending it! Looks nice and sounds good too...Prathiba :) Never bought long beans! Nice presentation! I like ur presentation so much, looks too good. Love all kinds of beans..this looks spicy and nice. i love lentils with any veggies..transforms it into something even more yummy! Nice combo, looks yummy and lovely presentation.